On the morning of May 15, 1916, approximately 15,000 people gathered near Waco, Texas to witness the trial and lynching of Jessie Washington, an eighteen-year-old black man charged with the bludgeoning death of Lucy Fryer. 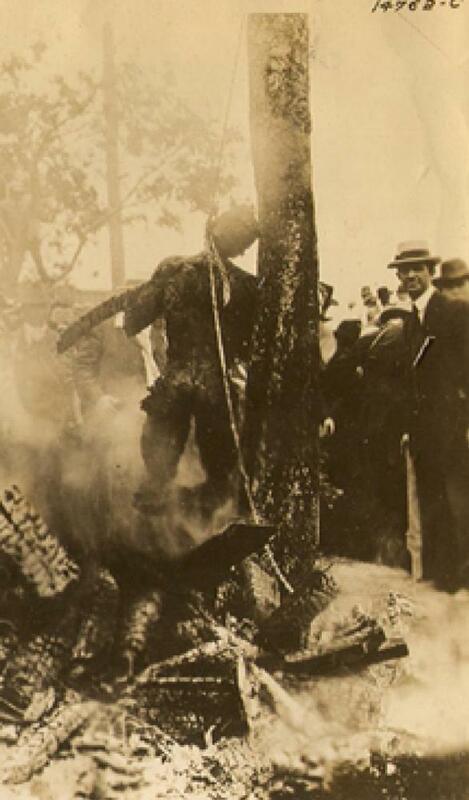 The brutal murder of Washington provided the newly formed National Association for the Advancement of Colored People (NAACP) with an opportunity to place lynching at the forefront of public consciousness, and thereby solicit support for its national anti-lynching campaign. The body of Fryer, a fifty-three-year-old white woman, was found by her children on the family’s property in Robinson, seven miles southeast of Waco. Jesse Washington, a laborer on Fryer’s farm, was arrested and charged with Fryer’s death. Tensions ran high in the town. When A. T. Smith, the black managing editor of Paul Quinn Weekly, reprinted a Chicago Defender article that proclaimed Fryer’s husband George murdered his wife, Smith was arrested, convicted of libel, and sentenced to one year of hard labor on the local road gang. Born in 1897, Jessie was the eldest son of George and Ellen Washington, who had twelve children. Jessie was described as having a quiet disposition and a mental disability. When asked during his trial whether he pleaded guilty or not guilty, Washington replied yes. Within hours of his arrest, Washington was transported to jails in Hillsboro and then Dallas where law enforcement officers assigned to protect him promised they would prevent a possible lynching if he confessed to the crime. His coerced confession was printed in three local papers, easily accessed and likely read by potential jurors. Illiterate, Washington could not read the confession that he ultimately signed with an X. By the following Monday morning, Washington was in the McClennan County Courthouse for trial. The jury deliberated for four minutes and returned a guilty verdict. Washington was then seized by a mob which had gathered outside the courthouse. Washington’s lynchers secured a chain around his neck and dragged him towards what would become his death site. Onlookers along the route struck Washington with shovels, clubs, and bricks, and stabbed him with knives. As his mutilated body neared the public square, someone lassoed Washington with a second chain that mob members tossed over the limb of a tree. Another mob member severed Washington’s ear and then castrated him. Several men then yanked the chain in concert and hoisted Washington into the air while others started a fire beneath his swaying body and doused him in oil. After he died, a group of local school boys removed Washington’s charred skull, extracted the teeth, and sold them for five dollars apiece. Others sold individual links of the chain used to affix Washington’s remains to a telephone pole for twenty-five cents. NAACP officials at their headquarters in New York City learned of the lynching and launched their own investigation without help from local officials. They learned the names of several mob leaders but were rebuffed when they offered this information to local authorities. To expose and combat the unchecked violence against Washington and other black lynching victims in the South, the NAACP issued a supplemental booklet to its magazine, the Crisis in July 1916. Readers of the “Waco Horror” were exposed to eight pages of details about the murder of Washington in what editor W.E.B. DuBois called a “typical southern town.” In addition to the magazine’s 42,000 subscribers, 750 newspapers and every member of Congress received the booklet. Another 12,000 copies were distributed as promotional material for the NAACP’s anti-lynching campaign. Scott, Terry Anne, “’Don’t Fail To See This’”: Race, Leisure, and the Transformation of Lynching in Texas,” Ph.D. Dissertation, University of Chicago, (2015); National Association for the Advancement of Colored People, "The Waco Horror," Supplement to the Crisis, July (1916); Patricia Bernstein, The First Waco Horror: The Lynching of Jesse Washington and the Rise of the NAACP, (College Station: Texas A & M Press, 2006). Scott, Terry Anne, “’Don’t Fail To See This’”: Race, Leisure, and the Transformation of Lynching in Texas,” Ph.D. Dissertation, University of Chicago, (2015); National Association for the Advancement of Colored People, “The Waco Horror,” Supplement to the Crisis, July (1916); Patricia Bernstein, The First Waco Horror: The Lynching of Jesse Washington and the Rise of the NAACP, (College Station: Texas A & M Press, 2006).